As a Long Islander endlessly fascinated by eventsthat happened in a place I call home, I hope withthis book to give the secret six the credit they didn tget in life. The Culper spies represent all the patrioticAmericans who give so much for their country but, because of the nature of their work, will not or cannottake a bow or even talk about their missions. When General George Washington beat a hastyretreat from New York City in August 1776, manythought the American Revolution might soon beover. Instead, Washington rallied thanks in largepart to a little-known, top-secret group called theCulper Spy Ring. Washington realized that he couldn t beat theBritish with military might, so he recruited a sophisticatedand deeply secretive intelligence network toinfiltrate New York. So carefully guarded were themembers identities that one spy's name was notuncovered until the twentieth century, and oneremains unknown today. But by now, historianshave discovered enough information about the ring sactivities to piece together evidence that these sixindividuals turned the tide of the war. Robert Townsend, the reserved Quaker merchantand reporter who headed the Culper Ring, keepinghis identity secret even from Washington;Austin Roe, the tavern keeper who risked hisemployment and his life in order to protect themission;Caleb Brewster, the brash young longshoremanwho loved baiting the British and agreed to ferrymessages between Connecticut and New York;Abraham Woodhull, the curmudgeonly (andsurprisingly nervous) Long Island bachelorwith business and family excuses for travelingto Manhattan;James Rivington, the owner of a posh coffeehouseand print shop where high-ranking British officersgossiped about secret operations;Agent 355, a woman whose identity remainsunknown but who seems to have used her wit andcharm to coax officers to share vital secrets. 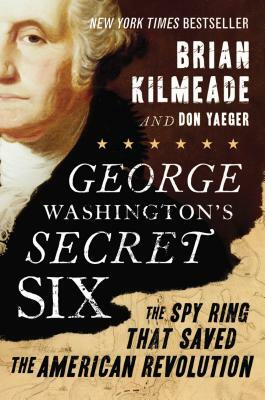 In" George Washington's Secret Six," Townsend andhis fellow spies finally receive their due, takingtheir place among thepantheon of heroes of theAmerican Revolution. Brian Kilmeade cohosts Fox News Channel s morning show "Fox & Friends" and hosts the nationally syndicated radio show "Kilmeade & Friends." The author of two previous books about sports, he lives on Long Island. Don Yaeger has written twenty-three books, including seven "New York Times" bestsellers. He lives in Tallahassee, Florida."